When contemplating poolside planting, there are several areas that need addressing beyond just aesthetics. While we all want our poolside sanctuary to look amazing it’s important to consider the style of pool you have chosen and what types of plants will compliment the materials used, how to add shading to combat the harsh Australian sun and thrive around your salt water or chlorinated pool without damaging the structural integrity of the pool. Consider what plants you could add to your poolside landscaping to provide shade and create some privacy around your backyard oasis. Bamboo and Tiger grass are excellent options for this and are frequently planted along fence lines close to pools to create privacy for your backyard pool. They provide fast growing shelter and seclusion between 4-8 meters within a year or two. Something to keep in mind with these ‘privacy screen’ providing plants is that you will need to be prepared for some leaf litter in your pool at certain times of the year. Several ways you can keep this problem to a minimum are to ensure that both the Bamboo and the Tiger grass receive plenty of water in the dryer months. This reduces leaf loss and maintains plant health. Regular filter maintenance will assist also, as will clearing leaf litter from the garden beds. Many of our clients have been happy to put in the little bit of extra time it takes in maintenance to possess such a stunning screen as each of these plants provides. Is the leaf tough and waxy like star jasmine? Is it furry like many Australian natives? Does it have a silvery sheen like olive trees? For those who are looking for that Tropical feel, try plants the well-loved giant bird of paradise, cordyline, Cascade palms, Raphis palms, bamboo palm, or golden cane palm. Perhaps you would like more of a neoclassical style for your landscaping, if so then frangipani and magnolia trees transport a romance from this era and due to their size once grown can also add privacy and shelter. Selecting the wrong type of plant for your pool area could cause serious damage to the pools structure in the long term. We cautious of plants with invasive roots like the Ficus family, running bamboo and umbrella trees which should be left out of these areas as they are likely to create problems in time. As are the common melaleuca trees. Take care to assess the potential size of your plant, large clumping plants planted in small spaces such as yucca can get out of control in a few years and be difficult to remove from narrow spaces. Your local council will also have available their safety guidelines, be sure to review and adhere to these to avoid any future issues. An informed selection of plants and a thoughtful landscaping guide will ensure that your pool area provides pleasure for you and your family for years to come. 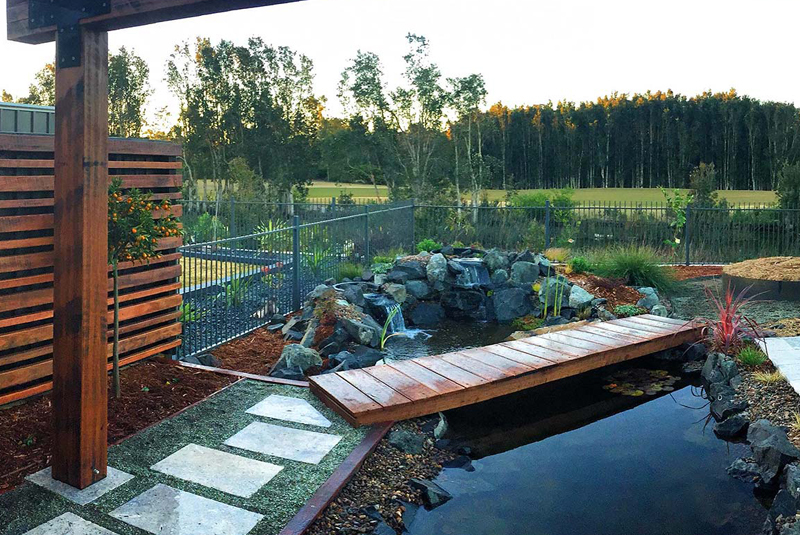 If you’re considering installing a pool in your backyard but are not sure where to start with your landscaping then get in contact with Utopia Landscaping & Pools. We specialise in create unique and beautiful outdoor spaces to suit every budget and vision. We’re passionate about our environment and harnessing its natural benefits for all to enjoy. Thank you to We Grow Plants for sharing their expertise and knowledge for this article! We Grow Plants are located 2 hours north of Newcastle and offer larger orders by delivery to the Mid North Coast, Newcastle, Central Coast and Sydney regions. We could not recommend them enough for beautiful and luscious plants of all kinds for your home and backyard! To contact We Grow Plants call on 0476 796 579 or email: wegrowplants@hotmail.com.